Some times we make adjustments in our lives, it’s a purposeful decision, other times we learn to accept the adjustment forced on us. I am aware that many families are all female except for the dad. So the dynamics, expectations and doing life together are what they are. Sometimes we do not know what we had until we lose it. It’s not that we necessarily take it for granted, it’s just we don’t know any different, that is life in our experience. In my case, I had my buddy as well as the girls. For 18 years “the boys” lived life doing boys activities. In most cases, the girls enjoyed the end results of what we were doing but did not really want to be involved in the process. So it we were having a barbecue, Mike enjoyed collecting the wood, making the fire and watching and waiting until the coals were suitable to cook over. The girls would just turn up for the food! 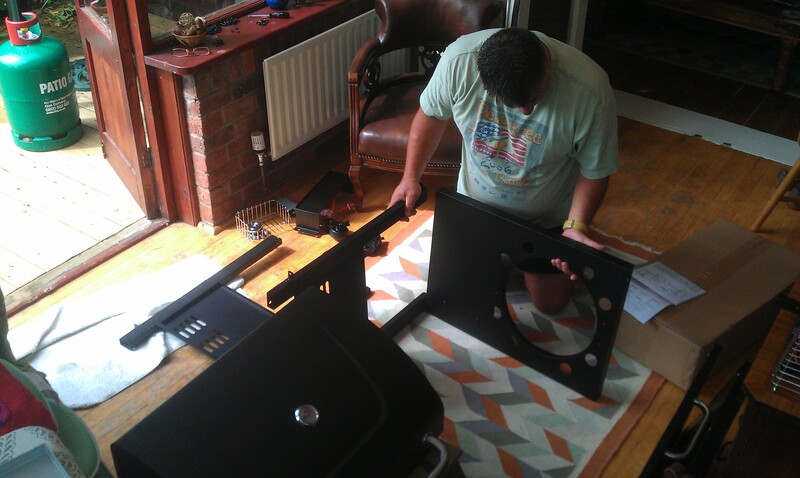 Mike and I also enjoyed removing new items from its packaging and assembling what ever it was we had brought. I have blogged before about the week before he died how we purchased a new TV/DVD/Surround Sound and glass table to put it all on. We had much fun as we put together parts in the wrong way, then saw it didn’t work and finally found the correct way. When Mike was clearing up all the wrapping he came into the kitchen and said “dad, look at this”, he had the instructions in his hand, now we had used them but they were simply pictures and not very detailed at all, but he then turned the paper over, only to discover detailed instructions on the reverse side. We stood there laughing together. The weather for the past two weeks has basically been rain every day and the forecast for the coming week is no better. With 40+ people coming for Akila’s party, I started to wonder how an earth will I look all the food on a wooden barbecue down the garden. I decided not to take the chance and knowing many stores are offering 50% of garden furniture I decided to buy a gas barbecue. The large box was 60KG without the gas bottle and so Kathy helped me bring it onto the conservatory to assemble. In my mind, as I started to unpack the box, I said “Mike, I’m going to read the instructions and get this one right”. Kathy had tears in her eyes and I realized this was the first box I had brought into the house since Mike’s death that needed the contents to be assembled. She was missing her boy. Well as typical with me, even though I read the instructions, I hadn’t gone far before I saw I had panels on the wrong way etc, I smiled when I realised and could hear Mike up there saying “how’s the getting this one right going dad!” He had such a dry sense of humor and would have loved to see me getting it wrong, simply as I had said I would get it right!. And so I continue to accept the adjustment of putting together household equipment without my buddy and all the fun and banter that went with it. I am grateful for the many happy memories I have of the times we did spent together and from his young age experiencing his excitement of opening the box. You are currently browsing the archives for the Memories category.